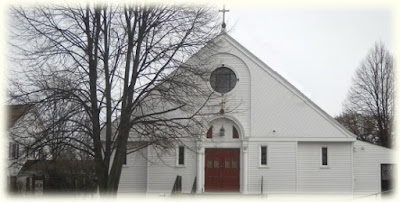 The new parish of St. John Vianney was established early in 1940. Mass was offered by its first pastor, Rev. Mark Harvey on the dedication September 29, 1940. This was the happy culmination of a dream for many in the little town of South Burlington. Religion classes had been started back in 1937 when Mr & Mrs Isadore Myers had asked for a couple of Sisters to teach religion to the children of South Burlington. At that time though, only ten or fifteen children were expected to attend. About forty came. When the newly appointed Bishop Matthew F. Brady came to the Burlington Diocese he appointed Fr. William Tennien to organize the Confraternity of Christian Doctrine in the area. In the summer of 1939 "Vacation School" was held in South Burlington and was closed with the first Mass being offered by Rev. Bernard Spears in the town hall on Williston Road on August 12, 1939. Shortly after Bishop Brady gave Father Spears permission to look for a site for a church. The rectory was built under the supervision of Father Harvey and completed in 1941. The population of the new parish was estimated at 863. While Father Harvey was pastor, the diocese bought several acres of land in back of the church for a diocesan cemetery. A portion of about an acre was also added to the lot on which the church was built. Bishop Brady announced that the new Catholic cemetery on Hinesburg Road would be known as "Resurrection Park". It was solemnly blessed on July 5, 1942. It was stated that there were no restrictions as to territory or nationality for those who desired to be buried there. In 1943 Rev. Bernard Spears accepted the Pastorate at St. John Vianney. While as assistant at the Cathedral Parish in Burlington, Father Spears had worked with the people of South Burlington trying to establish a parish and he was well acquainted with many of the parishioners. He was to serve the people of St John Vianney for the next thirty years. During the last twenty years of his stay, Mrs Alice Collins served faithfully in many capacities at the rectory and the church. In the early 1960s, because of a shortage of public school classrooms in the town, space was offered in the church basement for about one and a half years. In May of 1965, Father James M. Shea was the first young man to be called to the priesthood. In 1969, because of rapid growth in the parish, Bishop Joyce was asked by the Pastoral Board to give consideration to the establishment of a new parish in South Burlington. Although a site was purchased and many deliberations held, the project never reached fulfillment. At this time a lot had also been purchased next to the rectory for an expansion of parking facilities. By 1972 the parish had grown to 3,108 and South Burlington had become a city the previous year. Because of ill health Father Spears retired in 1973 and Father James McShane was named Administrator of the Parish until January of 1974 when Father N. Joseph Pray became the third pastor of St John Vianney Parish. After a fire in 1979 renovations were made for the first time to the original church. On June 22, 1980 Joseph Lane became the first deacon ordained to serve St. John Vianney Parish. When Father Pray was transferred to Bennington in 1981, Msgr. Robert Powers came to St. John Vianney as pastor. During his stay, extensive renovations were made to both the inside and outside of the church. Among these being the enlargement of the sanctuary and new exterior siding on the building. Just before this a special entrance for the handicapped had been added to the southwest end of the Church. Because of health reasons Msgr. Powers decided to retire in April of 1988 to be replaced by Rev. Charles P. Davignon who was transferred from Newport, Vermont. This was familiar territory to Father Davignon who had served the parish previously in 1979-1980. Through the years there were many vocations to the religious life from South Burlington and St. John Vianney Parish. Among these were: Sr. Lucille Trudell RSM, Sr. Grace Trudell RSM, Sr. Marie Therese Poulin RSM, Sr. Marie Georgette Poulin RSM, Sr. Lorraine Barrett RSM, Sr. Joyce Barrett RSM, Sr. Rose Blair CDP and Sr. Florence Poulin RSM. Pastors of St. John Vianney Parish were assisted over the years by many members of the Edmundite Community. The following priests were assigned to assist at St. John Vianney beginning in 1961: Rev. Donald Larouche, Rev. Emily Savary, Rev. Joseph Nugent, Rev. Roger Carlin, Rev. Joseph Symerski, Rev. Leo Courcy, Rev. Richard McGowan, Rev. James McShane, Rev. Brian Rickard, Rev. Andre Gaudreau, Rev. Albert Baltz, Rev. Charles Davognon, Rev. Edward Mahoney, Rev. James Hughes, Rev. James Mattison, Rev. Dennis Laroche MM. Also Serving the parish on temporary assignments were: Rev. William Mulligan, Rev. Julien LaFlamme, and Rev Stephen Borlang.